In Spring Meadow (according to the story in the rules): The first delicate flowers of spring herald the end of the harsh winter while the sun shines longer every day, pushing the snow back. Lush meadows begin to bloom and the curious marmots wake from their hibernation. Spring is finally coming to the mountains, making it a perfect time for a hike. Carefully plan your route, watching out for the marmot burrows. Pack a picnic as your chance to earn an edelweiss hiking pin is rather slim if you end up hungry and sitting on a rock among the remaining snow. That pretty much explains the game, so maybe I’ll just move onto my thoughts about it? OK, maybe not quite enough. In this game, each player gets an individual board, mostly covered white with snow. Scattered throughout the snowy field are holes made by marmots. There is a hiking map (a board with a 5×5 grid) which has randomly drawn meadow tiles placed 1 per space. On a turn, the active player takes a meadow tile from the column or row which the signpost is in front of (if you look a the board, there are small dots along the edges telling you which player uses that row or tile). Some of the tiles have holes in them – in general, these holes have to match up with the marmot burrow. So you look up and down the row, choose an available tile, and then place it on your player board. There is a reminder tile which can be placed on the board to mark the location of the tile you are trying to fit. The tile has to be placed somewhere on your board, and it must fit completely on your board. You can freely rotate and invert it. In general, you are trying to make complete columns of green space starting from the left of your board. If there is a hole in the tile, it must match with a Burrow printed on the board. However, if you have a previous matched hole/Burrow, you can cover this match with a marmot token to allow you to place a tile and cover up a different burrow printed on your board. Now check to see if you have lined up two or more meadow tile holes in an orthogonally adjacent grouping. If you have done so, you will earn a Rock tile equal to one space smaller than the number of holes in your group. You can choose a smaller sized tile if you want, but you may only take one rock tile per group per turn. This rock tile must be played immediately, and it can be used to fill in small incomplete spaces in your meadow. At the end of the turn, move the signpost one space clockwise around the board, and the next player can take their turn. The board is NOT refilled after a regular turn, and the selection of tiles will gradually dwindle. As long as you remember your starting player order, you should be able to check that the signpost is in the right place as the number of dots at the edge of your column will be the same each turn. Scoring happens at the start of a turn when there are 0 or 1 Meadow tiles available in the active player’s row to choose from. When this happens, the active player takes a Picnic tile and places it in front of him. Now, all players tally up their current score. The player with the most points wins the current scoring round and will take the picnic tile, flip it over, and show the Hiking Pin on the other side. Points are scored mainly by completed rows on your board – for each complete row going left to right, you score 10 points. Then, look at the first incomplete row and score one point for each grass or rock covered space in that row – even if there are complete rows further to the right! Then, all cleared burrows (those are burrows which have a matching hole on top of them) each score one point. Note that burrows covered by marmots DO NOT count for points. The active player scores two points for having the picnic tile. The player with the highest current total wins. IF there is a tie, the tied player who is furthest counterclockwise from the active player wins. The winner takes the picnic tile and flips it over to show the Hiking Pin side. The winner covers up all of his cleared burrows with Marmot tokens. Now, if the game hasn’t ended, the board is refilled with randomly chosen meadow tiles so that each space has a single tile in it. Only refill the empty spaces – all remaining tiles stay in the same spot. The player who first wins 2 Hiking Pins wins the game. There are obviously no ties. 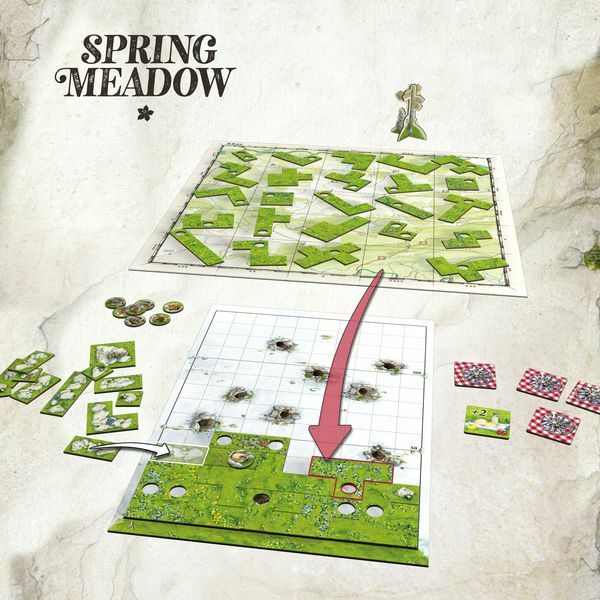 Spring Meadow is the third game in the tile laying series by Uwe Rosenberg – Cottage Garden, Indian Summer and now Spring Meadow. They all feel somewhat similar, but yet, each stands on its own. 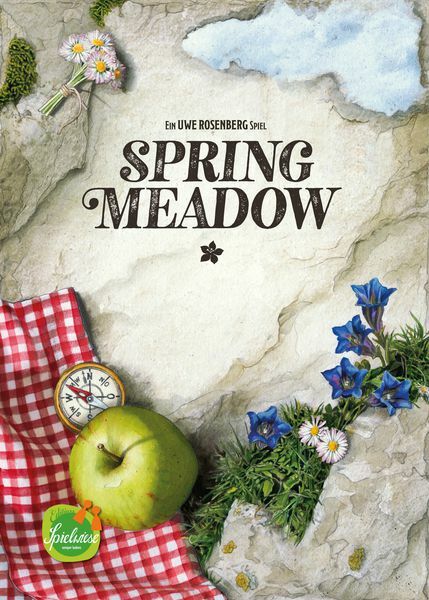 Thus far, Spring Meadow is my favorite of the bunch; mostly because I feel that the puzzle in fitting the polyominoes here is the most enjoyable/challenging. 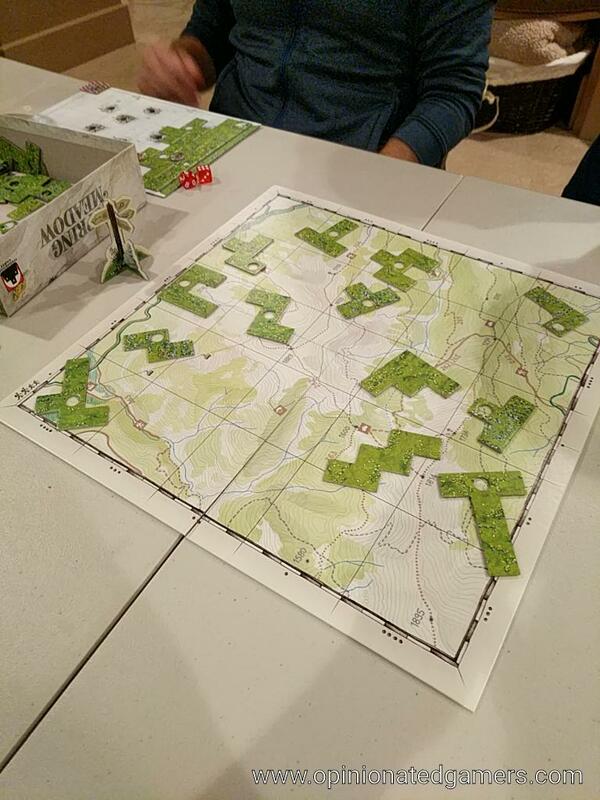 The game is mostly a solitaire on your board – but there is a fair amount of indirect interaction on the hiking board. As you can see what your next choices are AS WELL AS the future rows of all your opponents, you have a chance if you want to plan ahead a bit. You can try to deny an opponent of a particularly good piece for their board if it is equal amongst your choices. The bulk of the game is trying to get meadow pieces that work well to fill in your columns; with the smaller remainders being filled in with rocks as you get them. There is a bit of an art in getting the holes to line up to generate the rocks. As the burrows printed on the board are never adjacent, you have to figure out where to make your initial matching hole/burrows so that you can cover with marmots to generate the rocks. A pleasing little puzzle within the game. Spring Meadow has a lot of interesting timing issues. First is the management of the tiles on the board. I always look to see which tiles are at the intersection of my row on one axis and my column on the other – the tile at those intersections are guaranteed to be mine at some point. I often try to plan my board by grabbing other pieces first and then coming back to the ones I know that no one can take from me. Even if a scoring round happens, you’ll never lose the ability to grab those tiles as non-chosen spaces are never refilled. Also, the game is won by the player who first wins two scoring rounds. It doesn’t matter when you win them, you just have to the be the first to two. There are definitely times when I specifically leave a small gap behind (say 2 or 3 spaces) and wait until later in the game to fill it in with a rock. I’ll just keep building off trying to fill in the other lines as they come along; and yes, this means that I’ll likely have a very non-competitive score for one or two scoring rounds. But sometimes, you’re better off sandbagging like this because your score can easily jump up with the simple filling in of the hole. 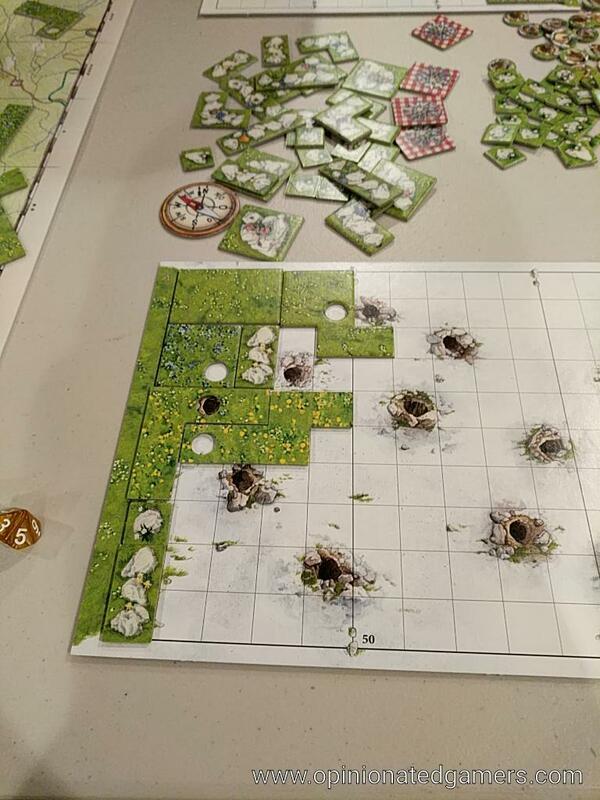 The “cost” of winning – having to fill in all your burrows with marmots – can be quite damaging to your pacing as you lose all of your burrows to generate rocks from AND you also cannot cover up any burrows on the board now until you make a match first. I have yet to see someone win by taking the fourth and fifth scoring rounds as the slowdown from the burrow filling makes it hard to continue filling in rows for the final score. For me, this is a great combination of puzzle solving with the tile laying/polyomino fitting and a little bit of tactical strategy in the indirect interplay on the board. The rules can be taught in under 5 minutes, and generally the whole game can be played in 15 or 20 minutes. It also works quite well with 3 in the one time that I played that way. Of the three Rosenberg tile layers, this one is the only one which is a sure keeper, though for now, they all stay on my shelves because I like having the set of them next to each other. Dan Blum (1 play): I also like this the best of the trilogy, although having played this and Indian Summer only once each that’s a fairly tentative opinion. (I definitely prefer both to Cottage Garden.) I appreciate the relative simplicity of this compared to Indian Summer, which has a lot of rules for what is at heart a straightforward tile-placement game. However, those rules would no doubt be simple enough with a few more plays, in which case it’s possible that Indian Summer would provide a richer experience than Spring Meadow. In any case I certainly enjoyed Spring Meadow and would like to play it again. Lorna: Spring Meadow is my favorite out of the three, it has marmots! I didn’t like Indian Summer as much because I dislike the steal mechanism. Tery: I don’t really like Cottage Garden, so I didn’t have high expectations for this one, and boy was I wrong – I loved it. The puzzle aspect here is so much more interesting to me; do you build up quickly and try to fill in with rocks, or do you move more slowly and wait for the perfect piece that lets you complete a row and maximize your burrow groupings. I was a bit worried when one player ran out to an early lead, but the balancing of covering your burrows once you score makes it possible for other players to catch up a bit. I look forward to many more plays of this game. Thank you for the review. The game looks like so much fun and I reckon could be a new favourite for me and my wife. I’ll have to see if I can buy it maybe for Christmas. The small amount of player interaction in the game should work for us perfectly.